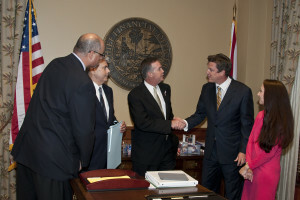 Tim Meenan and NAIFA Florida receive Life Insurance Awareness Month Proclamation from Governor and Cabinet | Meenan P.A. September is Life Insurance Awareness month and NAIFA Florida recently received a proclamation from Governor Rick Scott, Chief Financial Officer Jeff Atwater, Attorney General Pam Bondi, and Agriculture Commissioner Adam Putnam. Jeff Atwater, Florida’s CFO, presented the official resolution to NAIFA Florida President Jim Koburger, Tim Meenan, and other representatives in his office. Life Insurance is an important part of financial planning involving retirement, death, and other life transitions. Tens of thousands of life insurance agents work and live in Florida and many life insurers choose Florida to locate their administrative operations. NAIFA Florida and Blank & Meenan salute the Governor, Cabinet, and CFO Jeff Atwater for recognizing this important industry.